Rely on high quality transfer services with professional drivers and comfortable vehicles. Lower your travel costs and take advantage of the up to 7 % cashback bonus. Get access to GoOpti dashboards to easily manage and customize all your bookings. By registering a new business account, you become a member of the GoOpti business community, thus gaining the opportunity to receive a cashback bonus from 3% to up to 7% for each effectuated transfer. Hurry up and register your business account now. For each new user that books with GoOpti, you both get 5 € discount. It's a win-win. We recognized GoOpti as the most innovative Slovenian company in tourism already in 2012. 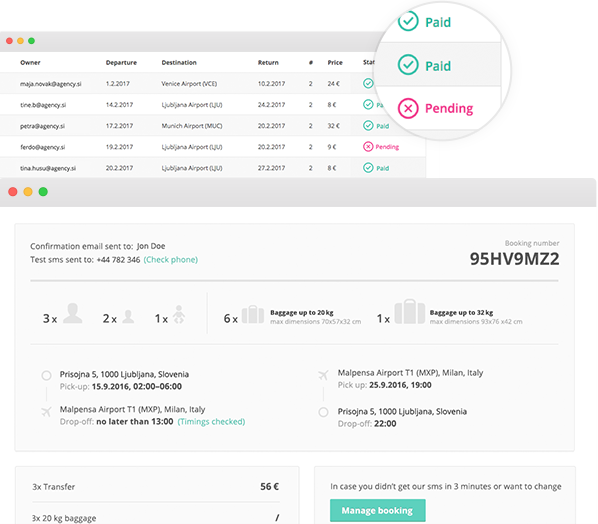 With a highly developed and efficient booking system, high standards and a variety of destinations GoOpti today contributes importantly to the accessibility of Slovenia as a tourist destination. We are continually satisfied with their services and receive positive feedback from foreign visitors, conference participants as well as travel agencies and our other business partners. GoOpti provides an indespensable door-to-door service for our hotel. Guests easily book transfers directly through an affiliated link on our webpage or we book on their behalf. We appreciate the fact that we can always count on GoOpti for a kind and comfortable service and that way keep our guests satisfied. Transfers are an important part of events – it’s where the visitor’s experience begins and ends. GoOpti delivers a flexible and professional support throughout the process and most reliable and comfortable transfers.